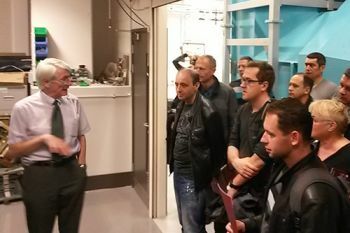 On 6th November, 23 members of the Croatian Society for Communications, Computing, Electronics, Measurement and Control (KoREMA) visited the engineering labs in the School of Mathematics, Computer Science and Engineering (SMCSE) as part of their 35th International KoREMA Conference. A contingent of twenty-three members of the Croatian Society for Communications, Computing, Electronics, Measurement and Control (KoREMA) visited the engineering labs in the School of Mathematics, Computer Science and Engineering (SMCSE) as part of their 35th international KoREMA Conference on 6th November. This visit was organised by Dr Ivan Sikora, Programme Director of the MSc in Air Safety Management, as part of an International Organising Committee with assistance from SMCSE Dean, Professor Roger Crouch, Professor John Carlton, Professor Nikola Stosic, Professor Chris Atkin, Dr Veselin Rakocevic, Dr Iasonas Triantis, Dr Sham Rane and Mr Donald Stirling. The visiting KoREMA delegation was drawn from higher education, industry and government in Croatia. Welcomed by Professor Crouch, the group was given tours of the Finkelstein Laboratory (Electrical Engineering), the Compressor Laboratory and the Merlin and Airbus A320 cockpit training simulators in the Handley Page Aeronautical Engineering Laboratory. KoREMA is a non-governmental and non-profit society founded in 1992 evolved from the former Society for Measurement, Control and Automation and ETAN, the Society for Electronics, telecommunications, Automatics and Nuclear Technology which were active in the Republic of Croatia and the former Yugoslavia for 40 years. The organisation has offices in Split, Rijeka and Osijek. The organisation is a member of the International Federation of Automatic Control. Automatic Control is the application of control theory for regulation of processes without direct human intervention. In the simplest type of an automatic control loop, a controller compares a measured value of a process with a desired set value, and processes the resulting error signal to change some input to the process, in such a way that the process stays at its set point despite disturbances.